The flat is located on the last floor of Residence “Li Velieri” with a view of the swimming pool and garden. The pool is open from June to September and has different heights, with a shallow, independent area ideal for kids. The area around the pool is equipped with sun loungers, umbrellas and tables. The flat has two double rooms and a double sofa bed for a total of 6 comfortable beds. A big terrace is ideal for an outside dinner. The whole area is very quiet. The Residence is sited in the center of the village and the Rena Bianca beach is only 10 minutes far walking. Discount rates are available in relation with the duration of your stay. I am 45 years old and I live in Pavia with my two sons. I work in the field of geology. My hobbies are reading, singing gospel, yoga, and I love cats. Sardinia is an island that can conquer you immediately, and this is what happened to me 25 years ago. I fell in love with the scents of the Mediterranean vegetation, with the bright light and with the transparency of the sea that has nothing to envy to the Caribbean (well…perhaps the temperature!). We go back every year and never get tired of it. Once you arrive, perhaps tired for the trip, first take your time and open the windows of the balcony, your luggage can wait few minutes. Breathe deeply and enjoy the scent of Myrtle in the air, look at the flowers in the garden beneath you and relax for a while by looking at the hills in the horizon. You are on holidays! We had a super time in the apartment and Santa Teresa Gallura! Francesca was very helpful and gave lots of good advise that made our stay even better. The apartment itself is in good shape and well equipped, and worked excellent for our family of 5 (kids 4,7 and 9 years old). The building and surroundings is very well kept and clean, and the kids loved the pool. The location is perfect, with everything within walking distance including supermarket, restaurants and town beach. All in all highly recommended, we hope to be back some time! Thank you so much for your kind words. It has been a real pleasure to host your family and to kwow that your stay has met your expectations! So we just returned from Sardinia. We stayed a few days at the residence and i must say we enjoyed the stay. Apartment comes with everything you need with a surprisingly useful kitchen. A lovely terrace where you can enjoy your meals. Apartment is in a residence building in the middle of the town so it easy to reach the center or the beach or the port in just few minutes walk. The residence comes with a pool..but it is open when the season starts (probably in June). Building it self very secure and safe. Only thing we missed is a washing machine.. but this is just some 200m down the street. Parking place is beside the residence doug im not sure how is it when the tourist season is at is height. Bottom line, we can recommend the apartment, and the owner Francesca is very helpful and kind with providing all sort of useful information a person would need during the stay. Thank you very much for your kind rewiew: I'm really happy you enjoyed your stay! 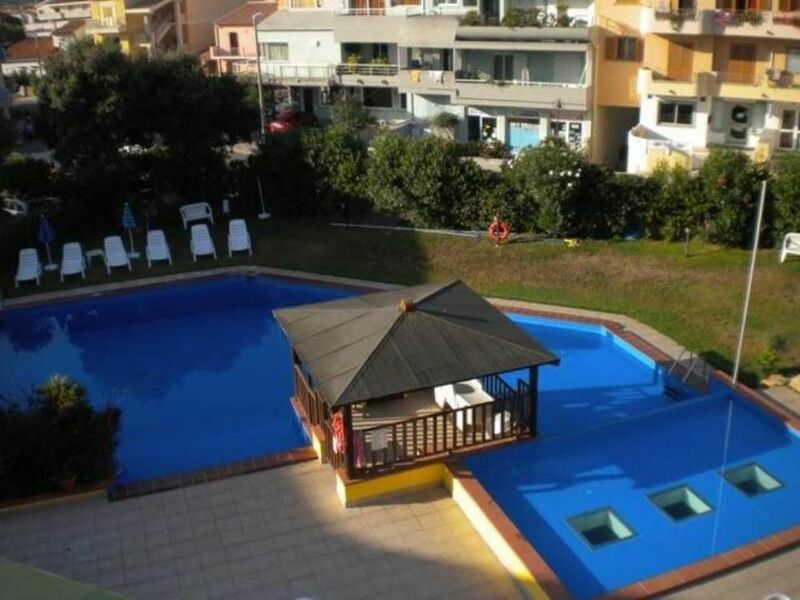 Centrally situated, close to supermarket, bus station and many restaurants. The property is perfect for a couple or a couple with two small children. Francesca, the owner, was extremely hands on and helpful giving us lots of advice and answering any questions we might have. The pool and gardens are well cared for and there is a life guard on duty most of the day. The apartment had everything for our needs and being on the 2nd floor, had nice views of the mountains. We ate breakfast and lunch there and went out in the evenings to the many restaurants which are all within walking distance from the apartment. The beach in the town is also only 10 minutes away and a lovely beach for swimming. As we did not hire a car, it was nice to have a beach and all amenities close by. We would stay there again. Thank you so much for your nice words: I'm very happy your holiday was pleasant and restful. I'm looking forward to have you back in Santa Teresa one day! The apt was very clean on our arrival and the owner had even provided for some cold water and cookies. Thanks for that! We enjoyed our stay very much and were pleasently surpriced, that the apt actually was quite cool in spite of the hot weather. Didn't need to use the ac once! Thank you so much, it was a pleasure to have you as a guest and to pamper you a little bit. I hope to welcome you again, a presto! We found our accommodation most comfortable with a balcony over looking the pool. Facilities were modern, clean and suitable for our requirements. We prefer to prepare our own meals, so the kitchen allowed us to do this. The owner assisted in every way, giving information, timetables and ensuring that the unit was suited to our needs. Nice quiet location, as well as being close walking distance to supermarket, city square and beach. L'appartamento è spazioso e ben organizzato. Fornito di tutto quello che serve anche per cucinare. Bella l'esposizione, mai troppo assolato. La sera cenare sul terrazzo è un piacere. Bella piscina, utile in caso di tempo incerto o forte vento. Il custode è sempre presente e molto disponibile. La propietaria, sebbene non fisicamente presente, è molto disponibile e simpatica. Il suo aiuto è prezioso se non si conoscono la Sardegna e i sardi. Grazie di cuore per la vostra recensione! Cerco sempre di ragionare come viaggiatore prima che come proprietario, solo così ritengo si possa offrire un servizio di ospitalità con un valore aggiunto. Sono lieta che l'abbiate apprezzato. Io d'altro canto mi sono trovata benissimo con voi, anche se in via... "differita". 1 hour by car from Olbia (Golfo Aranci) port and Airport. Follow indication for Palau and then Santa Teresa (1 hour trip). A bus-shuttle is also available from port and airport if you don't reach Sardinia with your own car (around 1 hour and a half trip). Cars and scooter can be rented everywhere. Typical cuisine and wonderful seafood restaurant at "Da Thomas" (very close to the residence). Firework display on the beach at 15th august. Local folkloristic events in town all along the summer. Beautiful beaches at Capo Testa. Diving center and horse riding. Free Wi-fi points available in town.